I'm especially pleased because Mr Pixley is one of the most authorative chroniclers of British TV in general and Doctor Who in particular. He's also a diligent researcher, on whose work I drew in writing the book. His approval means a great deal to me. I must also note that I recorded an interview earlier this week for The Geekender, a fine show on the equally fine Radio Reverb, which is to be broadcast tomorrow (Saturday) at 11am. The first book it listed was The Man Who Invented the Daleks: The Strange Worlds of Terry Nation. Which I already have. Mind you, there was a time a couple of months back when it was cheaper for me to buy my own book from Amazon than it was to get copies from my publishers. That can't be right. 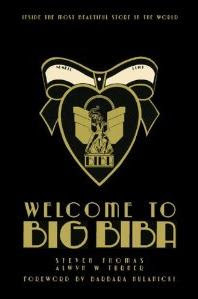 I see from Amazon that the new edition of Welcome to Big Biba, the book that I produced with Steve Thomas, is scheduled for publication on 24 August. That's one of the good things about Amazon: it tells you things that your publisher doesn't. Former Metropolitan Police officer Berger in Peter Flannery's Our Friends in the North, broadcast in 1996 and set in 1966. I've just added a couple more extracts from The Man Who Invented the Daleks to my website. This takes me up to Chapter 3 and still there's no sign of the Daleks themselves. The first of the new extracts talks about the wartime radio hits Band Waggon and ITMA, while the second does at least feature Terry Nation, but only in the context of his working relationship with Tony Hancock. I'm aware that most readers of the book are going to be those interested in Doctor Who, Blake's 7 and telefantasy generally, but part of the appeal of Terry Nation's career was that it covered so much ground. And those early days of radio comedy, and its gradual eclipse by television, are an endlessly fascinating area. For me, at least. But I'd hope that they're of interest to others as well. Because this is the world that people like Nation and Brian Clemens and Dennis Spooner came from - like almost everyone else in the country, they listened to the likes of ITMA when they were children. And although they may not be heard much anymore, those shows shaped a generation. A fortnight into the Great Phone-Hacking Scandal of 2011, and I can't help feeling that Ed Miliband is still missing his moment. Obviously he's managed to raise his profile and improve his reputation. He's done enough to ensure that there won't be any whispering about leadership challenges during the autumn conference season. But there's still no distance between him and the bad bits of the New Labour legacy. Indeed the clumsy contributions of his mentor, Gordon Brown, last week only served to remind us all of the continuities with the past. We've had a whole fortnight of righteous indignation, and I'm not convinced that Miliband has read the public mood properly. As far as I can tell, there was genuine revulsion in the first couple of days, when the stories of hacking into the phones of murder victims and dead soldiers first emerged. But the closure of the News of the World changed things. Now it feels like the public are simply enjoying a great soap opera - the tone is mostly one of gleeful fascination with the decline of Rupert Murdoch and his associates. I'm not sure that there's the political anger in the country that Miliband seems to assume. It may yet come, but there will need to be further revelations to relight that fire. And there will be more revelations. There's a long way to go. Things will calm down after Murdoch's appearance before the select committee this afternoon and the Commons debate tomorrow, but this is a story that's going to run and run. My suspicion is that Miliband would have done better to have kept some of his powder dry for the battles to come - he's in danger of looking like the boy who cried 'wolf'. This was a good time for a little humility, to prepare the ground for relaunching the Labour Party as an alternative government. Just to concentrate on attacking David Cameron isn't sufficient. Let's hope that the parliamentary closed season will give time for a more considered approach. When the leaderships of all the major political parties decide to agree on something, it generally means that they're up to no good. The British system isn't very good at consensus and - with the exception of bombing other countries - unanimity is normally reserved for responding to a media moral panic. The result is all too often an attack on civil liberties and/or badly formulated policy. It's not very inspiring, therefore, to learn that the Coalition government is planning to line up with the opposition tomorrow in a debate about News Corporation and BSkyB. David Cameron may have been left in a no-win situation, with little alternative but to share a voting lobby with Ed Miliband, but even so it doesn't augur well. Nor does the fact that both men are said to have expressed their sympathies with Gordon Brown, who has complained about being the target of intrusive investigations by the Sunday Times and the Sun. Presumably their concern is intended to be seen as outrage at the unwarranted coverage of the medical condition of Brown's child, but that wasn't his only beef. He also objected to the use of private investigators - 'known criminals' - using underhand means to look into his financial affairs. Whether or not Brown's allegations are accurate, you can see why Cameron and Miliband might similarly object to such practices. But the electorate should be suspicious of a political class that rushes to such single-minded condemnation. The press are perfectly entitled to investigate the finances of those who hold such high office. Our complaint shouldn't be that journalists seek such information, but that they don't do so nearly often enough. We all assume that the Daily Telegraph strayed into some slightly dubious territory when revealing the expenses claims of MPs, and most of us seemed perfectly comfortable with that. There were, though, those who weren't comfortable. And now they're trying to find some common ground on which they can join forces and demand changes in media behaviour. The cases of murder victims, dead soldiers and politicians' children shouldn't be allowed to serve as cover for gagging the press. It's not beyond the wit of politicians to find a way of curbing immoral excesses and intrusions into private lives without preventing investigative journalism. But it may well be beyond their will. Along with everyone else who follows the Westminster soap opera, I've been deeply unconvinced over the last nine months by Labour's new leading man. Ed Miliband was - to be generous - only the third best candidate in the leadership election last year, and he's been going downhill ever since he won. For far too much of the time he's looked solemn beyond his years, akin to the 12-year-old Jesus discussing theology with the elders in the Temple: 'all that heard him were astonished at his understanding and answers'. Except that what would have been considered precocious wisdom in a schoolboy looks like immaturity in a man in his forties. But the News of the World story this week has caused him to up his game considerably. He was impressive at prime minister's questions and he's kept the pressure on David Cameron for the last couple of days. And yet I can't help feeling that he's not making full use of the opportunity. Cameron's press conference this morning showed again what a competent operator he is. Miliband can damage him with the Andy Coulson and Rebekah Brooks connexions, but at this stage of the parliament, such wounds aren't going to be fatal. And possibly they're not going to be very long lasting. Miliband should really go beyond simple attack mode and seize the moment to make a decisive break with the excesses of New Labour's past. During Tony Blair's period in office the press, politicians and financial institutions displayed a contempt for morality, and even legality, as they reached new levels of arrogant, irresponsible behaviour that have brought all into disrepute and sent some to jail. The gap between rulers and ruled became uncomfortably and dangerously wide, and , while the Labour government may not have caused all the problems, it certainly did nothing to solve them, and its negligence (at best) made them worse. Of course Miliband was involved in that government. But only in a junior capacity. He's young enough that he can present himself as a fresh start, but to do so he has to wash his hands publicly of the past. Just as Blair jettisoned Labour history with the rewrite of Clause IV, so Miliband can now shed the embarrassing and unpopular parts of New Labour history. One of the things that most irritated the electorate about Blair was his refusal to apologise - there would be something rather refreshing if Miliband were now to say sorry for the things that went wrong. Above all, he'd look much more secure on the moral high ground if he could present himself as a repentant sinner. I'm very grateful to Frances Wilson for a kind review of my Terry Nation book in the Times Literary Supplement. I've never been in the TLS before and it's rather exciting. The relevant bit - which I shall be quoting for some years to come - is this: 'Turner is an excellent cultural critic.' I like that. I note as well that Paul Mount's review in Starburst magazine is now available online.